Call Tracking Software | Manage Your Business Leads | Who Calling? In a day where everything is digital and quick, it can seem impossible to track leads. How are you to know if your advertising is resulting in profit? How do you keep track of your web form submissions? Integrating other search engine results and Google Analytics make for a comprehensive view of your marketing attempts. 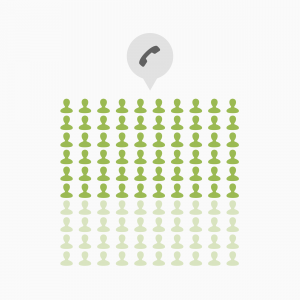 With the help of Call Rail, we at AdMoreZing can track every page a consumer visits before making a phone call. One way to do that is to assign a special phone number for every visitor. That special phone number follows each website visitor- all the while tracking the keyword that sent them to your site- and will follow the visitor until they call your business. To be put quite simply, this form of tracking will show you exactly what is producing the most profit for your business. A current study showed that 25% of consumers visiting your page will result in a sale. What does that mean for you? It means that the best way to increase profitable conversions is to have your leads measured by an agency like ours, because we dedicate the time to see what works for you and what doesn’t. For the possible consumers who rely on text messaging, we have ways to track those as well. The beauty of using text messages is that you are able to respond instantly, while still multi-tasking. One of the best ways to track everything that leads consumers to your site. For instance, if someone comes to your site one day through a Google AdWords campaign, and the next week they are lead to your site through an organic search. Basically, you can see the journey a consumer took before landing on a certain page. The importance of this tool is the ability it gives business owners to monitor the most cost-effective marketing campaigns. The most important part of marketing your business is lead response time. In a world of short attention spans, it is absolutely vital to respond to leads as soon as possible. We have the ability to report leads in real time- the actual time appears in your dashboard – so you can follow up as soon as humanly possible. If you find yourself wondering why your online advertising isn’t working, our call tracking services will give you the tools to fill in the gaps of your current strategy. A lot of companies are unaware of how much call tracking can help their business. Phone calls are such a personal way of showing consumers that you value their business, it can only help your profitability in the long run. If you know what pages a consumer visits before calling, you can tailor your approach to potential leads. There are many different aspects of call tracking, with comprehensive tools that allow for a better conversion rates. We will make sure that your plan is completely focused on the margins created specifically for your business.